Virtual universes are hype, that’s a sure bet. With very strong media coverage for universes like Second Life or World of Warcraft, announcers and users are discovering new spaces for playing, communicating, entertaining and even working which are in complete rupture with 2D spaces they already know. Complete rupture? No, not exactly since most of these universes are evolution from existing services (chats, social networks, maps…). All these virtual universes bring some oxygen to sometimes unappealing concepts by providing new possibilities. But with new opportunities comes a lot of covetousness and build a very competitive environment inside which the most media covered are not the most interesting. Do these figures astonish you? Well… so they did to me! But they are real. Comparing all these universes won’t make any sense. First of all because they are very different and then because they target very different audience. But if you REALLY need a comparison, then you can have a look at these two (partial) comparison charts: Virtual Worlds Comparison Chart, Casual Immersive Worlds and Virtual Worlds Platforms and User Numbers. Let me introduce you to these universes by using a map where I positioned most of them. All of these are not vast virtual world like Second Life, but they all share common characteristics: avatars, virtual currency and virtual places where avatars can meet, chat, play and interact. If you search for a high-quality version of this map, here it is: Virtual Universes Landscape. Obviously, all these universes are not at the same maturity level: some are approaching the final stage of their life cycle (like Everquest), some others are crossing a turbulence area (Yankee Group Says Hype of Second Life Far Outweighs Its Ability to Impact Mainstream Interactivity), others are growing very fast (Gaia Online) and some are repositioning themselves (like IMVU which is morphing into a social network and Entropia Universe which will try to compete with video games). With more than 150 active or soon-to-be-launched virtual universes, accept some numerous take over and disappearances. In this profusion, which universe is the right one? Its’ a hard guess since only two audience niches are sharply targeted: teen and adults (Virtual Worlds Are Trendy Spot for Kids and Teens). It took 10 years to structure the internet media landscape and provide announcers with reliable communication tools (adwords, adsens…) and measure tools. 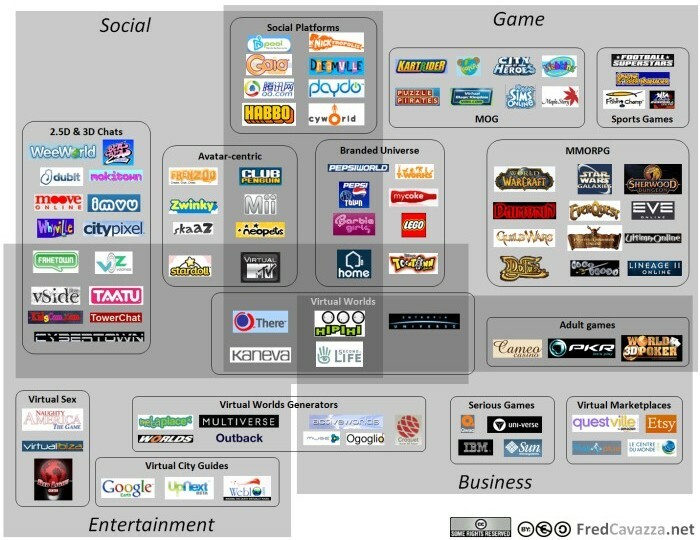 How long will it takes with the virtual universes media landscape? Who will master advertising inside these new territories / markets? Is co-creation a reality? So many questions… which will find answers in the next months. Stay tuned. 150 millions of Neopets users, People are crazy ! QQ has recently expanded its offerings to the west, opening an office in America. The first American offering is http://www.QQgames.com, which may be a better place to link regarding QQ than the South African portal site. Ping: citypixel.com blog » Blog Archive » Lots of competition!